Or do we tweet to be? Is Twitter a fad? It's actually irrelevant. Social media, in what ever form it may manifest, is here to stay. The fact is that social media is changing the way we search, read and share ideas and information. Simultaneously it's dramatically changing the way nonprofit or corporate brand managers could — and should be engaging their audiences. The real issue is to try to understand the fast evolving dynamics of the new media. Join the conversation, borrowing Twitter's slogan, may be the best way of doing just that. So whether you are an NGO or a corporation, just roll up your sleeves and get active in social networks. However, before you start twittering it's good to be aware of certain basic principles. Yes, it's fast to set things up and get going, but don't forget to do some thinking too. When properly executed, a social media strategy can bring you closer to your audience — and vice versa. Executed with the traditional advertising mindset it can, on the other hand, even lead to a disastrous PR scandal as we later shall find out. Ever been on a date where the other party has spent the whole time just talking about themselves? If you have, the chances are that there was never another date. If you only Twitter about yourself, your products or your services without listening and responding to what goes on in the twittersphere, you come across as just another robotic advertiser and nobody will want to follow you. Not only that, but it leaves a bad impression. So remember that twittering is about having a conversation, an actual dialogue. Not a "let's-put-our-brand-out-there-and-hope-someone-will-see-it" style traditional one-way advertising. Instead of being a robotic advertiser, try to think of your NGO or corporation as a person who has a personality. If your brand values are e.g. friendship, creativity and integrity, your tweets should make you sound friendly, creative and honest. Twittering is a great way of expressing your brand personality (definition of brand personality). 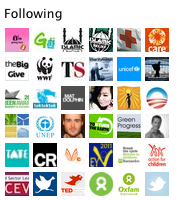 For a great example, we recommend you follow Greenpeace twitter. As in any form of communication, you should first understand who your target audience is and what they are interested in. So go on Twitter and find out what your audience is twittering about. While out there, it might be a good idea to have a look at your competitors too. How are they going on about it? Once you know your audience, the next thing to do is to figure out what you could be sharing with them. Is your goal, for example, to provide customer service via Twitter? In that case, take a look at the Twitter profile of ComCast customer service for an example. If you are a big corporation or an NGO with many target audiences, you might even consider creating a few different Twitter profiles tailor-made for each audience. For example Dell has set up multiple Twitter profiles and have made it clear that each has its own function and audience. If you want to, for example, receive promotional offers from Dell, then there's a specific Dell Twitter profile for just that. In this case, it's alright for Dell to twitter about promotional offers since that is what the profile's followers would have signed up for. Ford Motor Company has also set up many different profiles. There's @Ford, @FordRacing, @FordDriveGreen, @FordFiesta and, for example, @FordMustang. If you do decide to go down this route, remember to be upfront about it on your profile description and also profile name. As in any medium, you should make sure that you are recognizably, distinctively and consistently showing that your Twitter profile belongs to your brand. Although Twitter's interface may seem rigid at first, there is plenty of room for creativity. Be clever about designing your 73x73 pixel Twitter icon and be aware that it will be also automatically be reduced to a tiny 24x24 pixel version that shows up on the right column. If it's not recognizable in small, you'll have to work on it. One way forward might be to just use a part of your logo, like Amnesty International does on its Twitter profile. Alternatively, use an altogether different icon, as Greenpeace, and show the full logo on your background image. While you should ensure the visual language of your Twitter profile reflects your brand's values, you should also pay attention to your profile information on the top right corner. As you write it, have a good think about questions raised in the second principle we earlier introduced. Some, like 360i and Barnardo's, also add information to the background image on the left. To really understand what Twitter is about and what it can do for you, you really have to use an external application. It may sound ironic, but don't use Twitter to twitter. Instead use a website such as Hootsuite or software like TweetDeck. Check out the Twitter Fan Wiki for a long list of Twitter applications or the 99 essential Twitter tools by Smashing Magazine. There are many different options out there, but TweetDeck is one we've found useful. It helps you to monitor what's been said about you, by whom and what are the latest trends. You can also have a dynamic search up on your TweetDeck showing the real time development of discussion topics you may be interested in. What a great way to be gathering marketing intelligence! And that's all information you would have missed out if you would just be staring at your own static Twitter profile. Importantly, the software also enables you to shorten any hyperlink you would like to post. This is crucial especially as you should be adding additional narrative explaining any given link you are posting for your followers. And with only 140 characters to use, every character counts. Every time you tweet, make sure you actually add value to the conversation and to your followers by saying something meaningful. If you do say something totally irrelevant, you risk alienating audience who may stop following you on the click of a mouse. In the worst case scenario you might even end up causing an outbreak in the twittersphere as happened for Habitat UK. Habitat had a twittering-policy of posting tweets which included one of the 10 most popular hashtags (e.g. hashtag "#obama" is a conversation thread that shows all Obama related tweets) which most of the time were completely irrelevant to Habitat's tweets. This was their way of ensuring Habitat's tweets would receive maximum exposure. Ultimately, however, it caused a big uproar in the twittersphere. Read more about the Habitat UK case study. So be mindful especially when using hashtags. And remember too that a given hashtag might accidentally attract an audience outside the scope of the one you are trying to reach. You know the deal with email, think twice, right? Well it's about thinking three times before you tweet. Once it's out there, it's not just sitting in someone's mailbox; it's actually out there and being ReTweeted sometimes in the pace of a lightning. Partners? Competitors? Clients? Celebs? Family? Anyone? While it's convenient to follow someone you just happen to find interesting, be conscious about it as it also tells those who may look at your profile what type of a "brand personality" you have. So remember to always think about it from outside-in perspective too. If you don't have the time to engage in a dialogue with your audience, it might not be worth doing it in the first place as that's what it's all about. Mind you, they are probably twittering about you regardless of whether you are there or not — and your competitors are most likely already engaged in a conversation with your own target audience. If you are committed to taking the leap to the social media networks, ensure that also your staff or your volunteers are on the same page with your social media strategy. It's a good idea to establish some basic guidelines. For example, do you encourage your staff to start up their own Twitter profiles too? How should they go about setting them up? How do you "sub-brand" their profiles names, icons, profile information and other imagery? What can they be talking about and how? Can they have public or private only profiles? If you still need more food for thought as you consider kick starting your social media campaign, we recommend having a read through the Social Marketing Playbook by 360i while Mashable provides an extensive Twitter Guide. Some of the principles introduced were based on an interview of Michael Brito published by Mashable. If you are completely new to social networks such as Twitter and Facebook, we recommend you to first sign up as private person and get active amongst your friends. Through that learning process you will build up your confidence to be able to go out there and officially represent your nonprofit or profit-driven business. Follow me Twitter at http://www.twitter.com/finntastico. The European Volunteer Centre is running a competition on behalf of the European Commission to design the logo and the slogan for the European Year of Volunteering 2011. There are tons of visual identities and slogans to choose from, so cast your vote! I'm a digital researcher and consultant helping corporations use #socialmedia. I define myself also as a social entrepreneur. Campo Libero in Social Design Exhibition, Zurich, Museum für Gestaltung, 04.10.18 – 03.02.2019.